Twitter is not the usual media for political flame wars in Hoboken; at least not yet. That's why we have Facebook (and Al Sullivan of the Hudson Reporter to thank). Carmelo doesn't "know." Unless it's an election and his spokespeople voice concern when they are out muscled with the creative use of VBMs in that election cycle. Then of course VBM fraud is a problem. 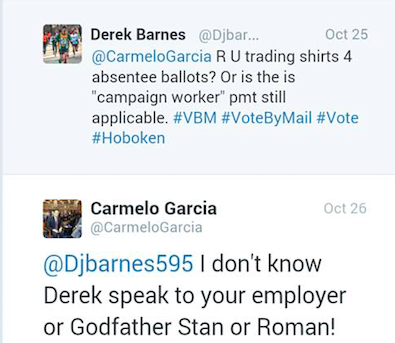 Here's a Carmelo Garcia acolyte he tried to install on the Hoboken Housing Authority in 2013 more than once but failed talking about VBM fraud and "guinea pigs." Apparently, there's an Old Guard view, any Hoboken citizen who dares question the Old Guard on any topic of public interest, especially corruption means that someone must be paying them to do it. Let's put aside the example above, Councilwoman Terry Castellano's reaction appears less than enamored as Beth Mason happily nods to Matty's voter "assistance" referenced. The Old Guard is not endeared by the Hoboken public seeing the dirty laundry in public. Al Sullivan, you and the Hudson Reporter appear to be suffering from a similar problematic perspective calling me on Facebook a "Puppet for Zimmer." That's not only incorrect; it's defamatory and you can look at your hundreds of emails donated to you in a live litigation by Carmelo Garcia and print anything you believe proves your claim. While you're at it, the Hudson Reporter can go ahead and print any Beth Mason - Ricky Mason connected email to the Bajardi v. Pincus case when it awakens from its cover up slumber. As for Mister Carmelo's reference, you can call Stan the Godfather if you like, but my friends call me Horsey. You may call me Mr. Horse. On Election Day, Reform intends to show how wrong both Carmelo Garcia and Al Sullivan are. Talking Ed Note: What some refuse to see staring them in the face is that Hoboken residents have had enough. We're fed up with the suppression of facts, real news, the tacit wink to corruption at every turn in all its forms and we're not taking it anymore.